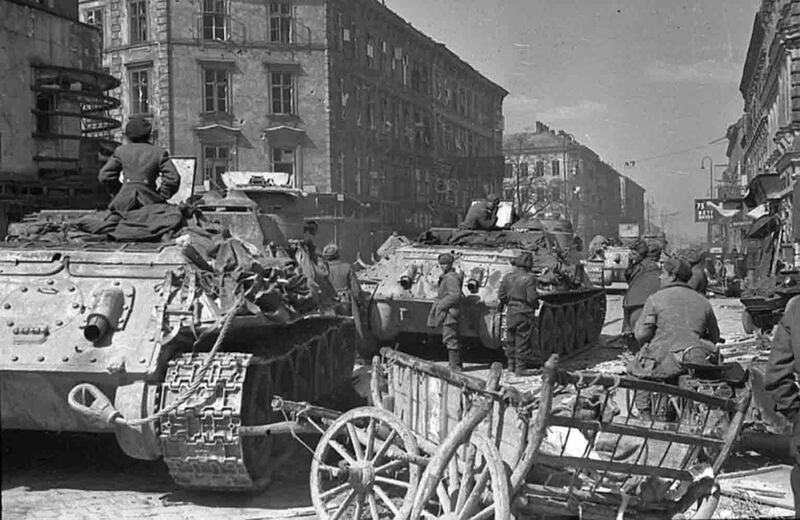 A column of Soviet medium-sized self-propelled guns SU-100 on the street of the city liberated from the Nazis. SU-100 – Soviet anti-tank self-propelled artillery cannon of the Second World War, a class of tank destroyers, medium in weight. It was created on the basis of the medium tank T-34-85 by the Uralmashzavod design bureau in late 1943 – early 1944 as the further development of the SAU SU-85 due to its inadequate capabilities in the fight against German heavy tanks.